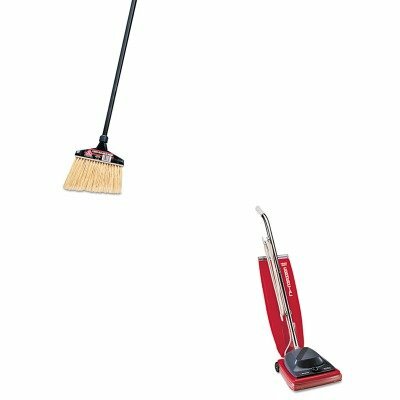 lt;stronggt;DRA91351EAlt;/stronggt;lt;BR/gt;O-cedar Maxi-Angler Broomlt;BR/gt;Big sweeping surface with angled cut for hard-to-reach corners or under furniture. Washable, flagged-tip bristles are unaffected by water, alkalies, acids, grease or oil and won't wear down, break or fall out. Plastic angled shroud has patented handle-locking mechanism. Application: Floors Bristle Material: Polystyrene Bristle Length: 13amp;quot;.lt;BR/gt;lt;BR/gt;lt;stronggt;EUKSC684Flt;/stronggt;lt;BR/gt;O-cedar Maxi-Angler Broomlt;BR/gt;Help eliminate germs and dust from your workplace, business or home. The Micron Filter system retains up to 99% of pollens and dustgreat for the hospitality industry where high standards of cleanliness need to be maintained at all times. Utilizes the spiral design of the exclusive Vibra-Groomer II brush tool that produces an effective wave action, vibrating and subsequently capturing deeply embedded dirt. Vibra-Groomer II has chrome steel ball-bearing brush roll, with replaceable bristle strips and is lifetime lubricated. Provides users with a range of cleaning options with the six carpet settings. Current: 7 A.